Yamaha's YSP-5600SW Dolby Atmos-enabled soundbar system has scrambled my mind. It sounds like a fully-fledged home theatre but clearly isn't; it looks like a soundbar but is something altogether more advanced. 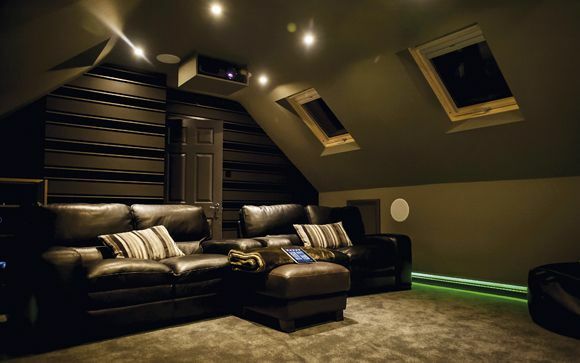 Could this be the future of home cinema? The soundbar (Yamaha prefers the term sound projector, hence the YSP branding) is certainly a sizeable beast. Some 1,100mm wide and weighing 11.7 kg, it’s a significant piece of kit to install. You'll need either wide, solid furniture (don't think about adding this to a bedroom TV) or a sturdy wall – it can be mounted using the optional SPM-K30 bracket. There’s no room for fancy design. With tapered edges, the YSP is all front-facing mesh, behind which hides a 46-speaker beam array – each mini driver controlled by its own time delay setting and amplifier. Placed at the edge are twelve (2 x 6) 28mm upward-angled height speakers. These drivers utilise the same technique favoured by Dolby-enabled speakers, bouncing audio off the ceiling to create a height channel. In between are 32 beam drivers used to paint the L/C/R and surround, plus two (sub)woofers. There's a lot of directional acoustics at play here. The YSP’s total claimed power output is 128W. There’s a significant complement of connections, too, including four HDMI inputs and one HDMI out. However, only one HDMI is 4K/HDCP 2.2-capable – which might prove frustrating if you want to hook up both an Amazon Fire TV 4K box and an Ultra HD Blu-ray player, for example. Audio inputs comprise phono stereo, plus three digital audio inputs (two optical and one coaxial). There’s an Ethernet port and USB, but the latter is for service use only, not media playback. Wi-Fi and Bluetooth are integrated, and there’s support for AirPlay too. You’ll also find IR control inputs, an RS-232 port and a phono subwoofer output. While the YSP-5600 can be purchased solo for £1,600 and partnered with any existing subwoofer you may have, we’re reviewing it here in its YSP-5600SW iteration (£1,900) which includes a bundled Yamaha room-shaker, the NS-SW300. This subwoofer can be wired or used wirelessly, via a subwoofer kit (the SWK-W16, supplied). This powered pyramid connects via phono to the LFE input. All you need do is instruct the soundbar to pair. The subwoofer itself has a 250W powerplant and a 10in driver, aided by an unusual Twisted Flare port. It’s finished in glossy piano black. Like its soundbar sibling, it's a sizable piece of kit, weighing 18kg and standing 36.6cm high. With both soundbar and subwoofer powered up and wired in, the first thing to do is run IntelliBeam optimisation with the supplied microphone. It should be noted I had to make balancing adjustments to horizontal and vertical angles, beam travel length and focal length, as the auto calibration was somewhat off. These tweaks actually made a huge difference to the coherence of the YSP’s performance. To aid with installation, the soundbar offers a three-point dialogue lift to better locate the centre channel to your screen. While Yamaha's AV receivers feature a user interface with graphical flourishes, it's perhaps disappointing to discover that the menu interface here is built around simple, low-res text. It won’t win any design plaudits. Thankfully you don’t have to look at it for long. First reactions to the YSP-5600SW are basically shock and awe. This combo plays loud with crisp front-of-house imaging. The opening of J.J. Abrams' Star Trek reboot (Blu-ray, DTS-HD MA 5.1) sees the Enterprise dwarfed by the invading warship of nefarious Nero. An incoming warhead splinters into multiple barbs, which rip apart the Starship. The Yamaha throws sonic debris wide and high. When Captain soon-to-die flies to meet the giant invader, his shuttle thrums deep and lands with audible solidity; the ambiance of the alien vessel is all too vivid. When evacuation calls, the soundstage is alive with incident; not a single emotional beat is lost as James T. is delivered in the escape pod. Similarly, the bravura opening scene to X-Men 2 (DTS-HD MA 5.1) sees Nightcrawler bamf his way into the Oval Office. Secret service agents try to pepper his tail, resulting in gunfire popping like corn all around. Of course, the real test of the YSP-5600SW is recreating a Dolby Atmos soundfield – can immersive audio really be drawn from a single enclosure, no matter how many drivers are coerced? Yamaha boasts the system is comparable to a 7.1.2 Atmos system. In truth, it’s not far off. Amaze is a classic Dolby Atmos trailer, which features an insect buzzaround, deep bass thunder and rain shower from overhead. The clip reveals much of what's great about the YSP, and where its limitations lie. I've never auditioned a soundbar that truly replicates the surround soundstage of physical speakers, and that remains the case here. But the YSP does get tantalisingly close. What it can do with some authority is deliver the height indicative of an Atmos experience. In Amaze, while the insect fly-around never quite gets behind your head, the funky height rattle is spot on! I installed and auditioned the system in two very different rooms. One had a level of acoustic treatment, a mix of hard and soft surfaces, as befits a listening room. The other was more sonically hostile, basically a reflective square cube. Normally the latter would be a difficult room to serve, but for the Yamaha it proved ideal – an important point if you’re looking to put a decent sound system in a minimalist studio room. The YSP actually has four listening modes. 3D Surround uses five horizontal beams and two vertical beams to recreate a 7.1.2 soundfield. Surround is used for conventional multichannel sound sources. This uses five horizontal beams to deliver a 5.1 mix, sans height. For two-channel sources select Stereo, which uses a dedicated vertical beam speaker as a tweeter. There’s also Target, offering mono speech trickery. In addition, there’s a selection of Cinema DSP modes themed around Music, Movie and Entertainment (ten in all). As well as being Atmos-enabled, the YSP-5600 can also (eventually) be firmware upgraded to DTS:X. Gravity has one of the best Dolby Atmos executions heard to date, with inventive channel isolation: the opening scene features comms dialogue top right, panning left across the front soundstage, which the YSP handles well. Then the debris shower hits the Space Shuttle with enormous force, and the impact is jolting. Both the weight thrown by the soundbar and the tightness of its imaging are revelatory. When we're in Bullock's helmet, her voice is high and reverberant, When the POV shifts outside, the soundstage goes from quasi binaural to near-mono and the subwoofer throbs. This is terrific stuff full of body, attack and detail – the multi-driver array exhibits a forceful midband adept at dialogue. Of course, with all this excitement about immersive audio, it’s too easy to forget that the sound projector is also MusicCast-enabled, which means you can not only throw it music from your mobile device, but include it as part of a multiroom system. Networked audio playback covers a good range of files and codecs too, including MP3, WMA, AAC, WAV and FLAC. Overall, I rate the YSP-5600SW as a superb proposition. It’s hands down the best-sounding two-box cinema solution I’ve heard this year, and in terms of height and width effectively delivers an Atmos experience. It’s not a replacement for a full-blown 7.1.2 theatre system, more Atmos-Lite, but it comes close and is a lot easier to manage. And that in itself is remarkable.